Vimbai Matekaire Hungwe was killed in a car accident in Midrand on 6 June 2010. 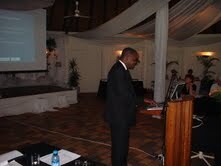 He was laid to rest in Zimbabwe on 12 June. for those who wish to post their messages. In South Africa Vimbai played a vital role in bringing AHILA to the attention of the medical and health information community. At the HICSA meeting held on 24 November 2009 the new committee was elected. The photo above shows David Swanepoel (OVI library), John van Niekerk (MEDUNSA Library), Vimbai Hungwe (President AHILA) and Prof Ina Fourie (University of Pretoria). 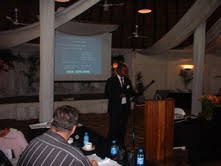 At the 3rd HICSA conference, 24 November 2008, Onderstepoort, Vimbai gave a most interesting presentation on AHILA , sharing his enthusiasm for the organisation with his South African audience. It was largely due to his influence that the medical and related health librarians became inspired to join the AHILA fraternity. Vimbai was elected to serve on the new HICSA committee for 2010 – 2012. At the meeting of 24 November 2009 he once again promoted AHILA and we knew that with him as committee member we would definitely be motivated to pursue this objective. I hope that his inspiration will not have been in vain and that HICSA will become an active participant in the AHILA community.